Vintage Haxs: Top 5 Products. These are my tops 5 products which I couldn't survive without. 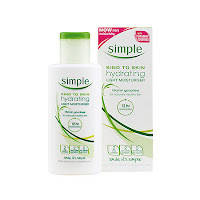 1- Simple light moisture. This is my life it is great it is always in my skin routine. I put it everyday and massage it into my cheeks forehead and around my nose. It leaves my skin feeling smooth and hydrated. It is great for people with sensitive skin and the world best skin product. 3- My Champneys Spa treatment Hand and Nail cream. I use this two times a day before I go out and before I go to bed. It smells like honey and leaves my hands feeling moisturized and soft to touch. I like that before I go to bed as well as they feel clean and fresh and feel good in the morning. I have a travel sized one at the moment but it has lasted me ages. 4- Hairspray I have a pixie cut and if i don't put hairspray in my hair looses it shape meaning the style doesn't look good. I use Silvikrin classic hairspray. It does it job it last all day and still makes my hair look natural. I carry it in my handbag and on my bedside table it makes my hair look neat if I need to tidy myself up. 5- My last product is Baby Lips lip balm electro. What I love about this lip balm is it gives a hint of colour so if I'm just popping out I can smack some on and it's moisturizing my lips at the same time. I have one in my handbag and I always have it on me.